I happened upon these by chance, having never heard of the Moshi brand prior to finding these so I was understandably a bit skeptical but my skepticism didn’t prevent me from purchasing a pair based on a number of positive reviews I found from various sources. The build is quite impressive, what with the stylish triangular metal alloy housings, and the thick braided cable. The housings are sturdily built and are actually rather heavy, probably the heaviest of any IEM I’ve tried. I didn’t have much of an issue with them in terms of weight but wearing them cable up was certainly preferable to wearing them straight down in terms of comfort. In addition, iPhone and smartphone users should be pleased to note that the Vortex includes a 1 button remote and microphone for taking calls. This is a superfluous feature to me but I’d imagine it’d worth noting. Speaking of comfort, the silicone tips were a bit too shallow in my ears and I ended up replacing them with Sony Hybrids. In terms of sound quality, I must say I’m impressed for the price I paid. The low end has more presence and impact than I was expecting, which, at least in terms of sheer volume can run with just about every heavy-hitter I have in my collection. It extends in a linear fashion to the lowest sub-bass regions and remains powerful and rumbles nicely at 30Hz or so. The Moshi loses out in terms of bass texture to the harder edged Atrio M5 and Miles Davis Tributes but seeing as the Moshi is less than half the price of either those two, I’d say its low end performance is quite impressive. The midrange is slightly recessed compared to the lows and can sound a bit smeared at times and lacks transparency, especially when compared to something like the RE0 or the ADDIEM. 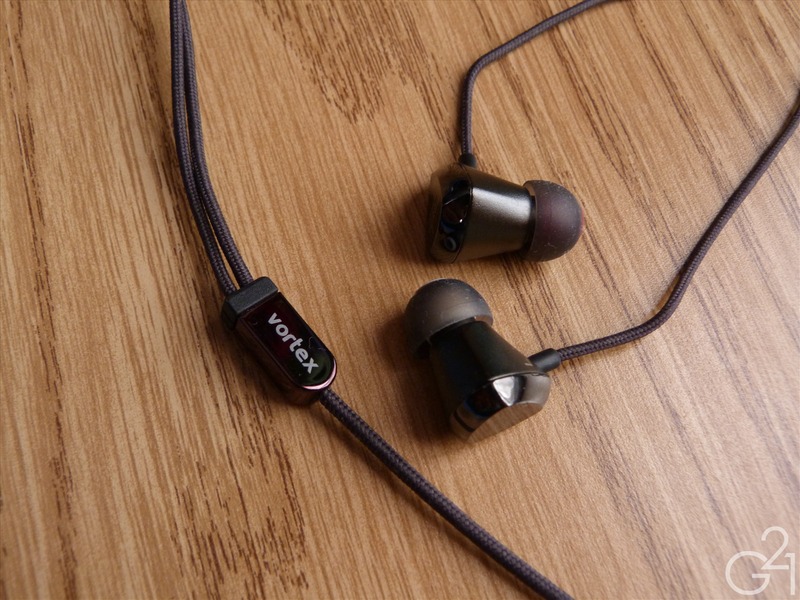 The Vortex isn’t a bad performer in terms of its midrange but its thick sound likely won’t appeal to everyone. Moving up to the high end, the Vortex is somewhat laid back, much like the midrange, though its lower treble edges close to the sibilance line but never quite gets there. On the whole, the Vortex portrays treble detail decently but lovers of sparkle and airiness in the upper frequencies should look elsewhere. On the whole, the Moshi Vortex has a thick and dark sound signature. It can sound a bit strained when confronted with busier tracks and doesn’t have the same clarity as some of its competition but bassheads should be quite pleased with these, with their fairly tight, if a tad slow, low end with fantastic extension and a lack of a distracting midbass hump. But here’s the rub. While these retail for $80, I managed to get them for $20. At the latter price, I think these are a great deal and are well above most similarly priced IEMs. At the full retail price, I’m not so sure. For the bass lover, there aren’t many IEMs that can compete with these, even at $80 and the sound quality is good, but not as good as my sub $100 benchmarks. But, if you’re a basshead looking for an iPhone compatible headset, this is a pretty good choice under $100 and if you can get them for well below the retail price, as I did, they’re an even better buy. If you'd like to contribute to Musical Musings, please donate here! All donations are appreciated!